Business owners and marketers everywhere know that positive customer reviews are great for business. Not only do they provide valuable feedback regarding customer expectations and experiences, but they also assist brands in establishing a reputation for quality, gaining consumers’ trust, and connecting with more potential shoppers online. 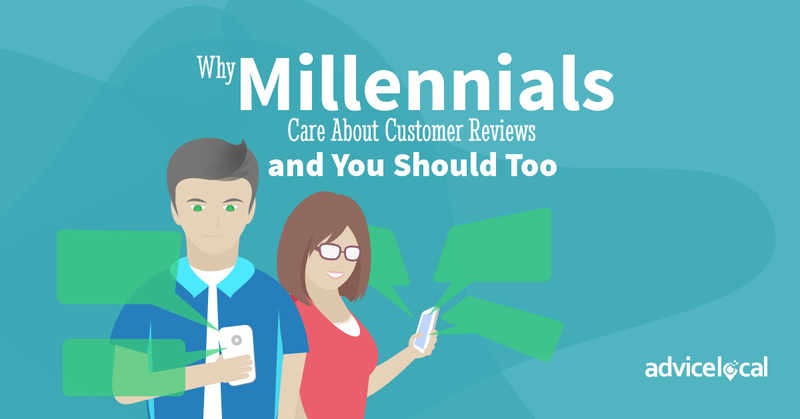 Collecting customer reviews is especially important for businesses targeting the highly social, frugal, skeptical, and mobile-focused group of consumers known as millennials. Let’s take a closer look at why today’s largest generation of Americans takes customer reviews so seriously to learn more about why business owners should, too. A polished product description is less likely to sway these skeptical shoppers than a candid comment by a friend or peer. Therefore, word of mouth is one of the most valuable forms of advertising for businesses targeting millennial consumers – even if it’s online (especially since millennials are heavily connected to social media and digital communities via smartphones). In fact, according to Bright Local’s Local Consumer Review Survey, 84% of consumers today trust online reviews as much as personal recommendations from a friend or family members. Today’s most savvy spenders don’t believe everything they read or see and no longer view the media as an authority. Consumers trust real people more than businesses, so developing an authentic, human brand presence can go a long way in earning customers’ trust. However, these efforts should be coupled with the intention of earning more customer reviews and recommendations. For instance, a local shop can drive offer an in-store bonus to anyone who shows proof of an online review or who refers a friend within a month of their first purchase. As the generation that grew up with the emergence of social media, it’s second nature for millennials to turn to their online peers for advice on just about everything. From restaurant recommendations to apparel reviews to technology price comparisons, social media connects consumers to a massive network of testimonials that they trust to help make informed purchasing decisions. Consider that up to 90% of shoppers make use of smartphones in stores, making this type of ‘social buying’ more accessible and immediate than ever. Social buying is more common than ever, so it’s necessary for businesses to collect and distribute positive customer reviews via social media. It’s not enough for brands to simply exist on social media; businesses must be conscious in their efforts to connect with consumers by encouraging and incentivizing customers to share their shopping experience or purchase. This kind of social proof can help boost sales among millennial consumers and social shoppers of any generation. Whether it stems from a frugal mindset born of never-ending student loans or a desire for sustainable goods that are better for the environment, millennials often prefer high-quality products to cheap alternatives. Essentially, they want to ensure the money they spend goes towards quality products that won’t need to be replaced in the near future. Consumer reviews come into play yet again, since many shoppers would rather spend the time reading online reviews and comparing the value of two similar products than simply choosing based on cost or convenience. As much as 93% of millennial consumers read online reviews (usually on mobile!) before making a purchase. Since a huge percentage of consumers feel they can’t evaluate how awesome a brand is without confirmation from an already-satisfied customer, even businesses with high-quality products or services should actively ask customers to write reviews. Otherwise, those potential customers might be put off by the lack of information available about the brand online and instead be swayed by the reviews of a competitor. Now you know why Millennials care about reviews! We have just the solution to make it easy to monitor and respond to them. Click below and get started. How do you encourage customer reviews for the business you represent? Thank you this article was very insightful.